Kirk Johnson has been on a mission to provide the gift of music to lower income schools and children. As a musician, performer, and educator; Kirk believes that all children should have access to music education. Out of this belief, he founded SOUNDS Academy, a non-profit music education organization that teaches, mentors, and provides musical experiences and opportunities for underserved youth. SOUNDS Academy gives instruments to students that cannot afford one of their own. His unique approach teaches the character values of creativity, leadership, perseverance, resilience, and teamwork through music education. Students also learn to use their music as service opportunities by participating in performances at hospitals, shelters, or retirement homes. SOUNDS Academy works with over 30 organizations to bring musical opportunities to the schools and children in lower income areas. He began his musical journey in Boston, Massachusetts with Project STEP. Through this program, he learned to play the violin and viola, took theory classes, and participated in chamber music and orchestral playing. While participating in the Preparatory School of New England Conservatory, he worked with conductors like Benjamin Zander and toured countries like Italy, Mexico, and Cuba. Kirk graduated with a BM in Viola Performance and a MEd from Indiana University. It is here that he was introduced to the world of string pedagogy under the guidance of Mimi Zweig. Inspired by his experiences with Project STEP, New England Conservatory of Music, and The IU String Academy, Kirk founded Owen County S.O.U.N.D.S. (Students Opening Up New Doors with Strings) in the Fall of 2003. This program continues to educate the children of Owen County as a successful non-profit organization. 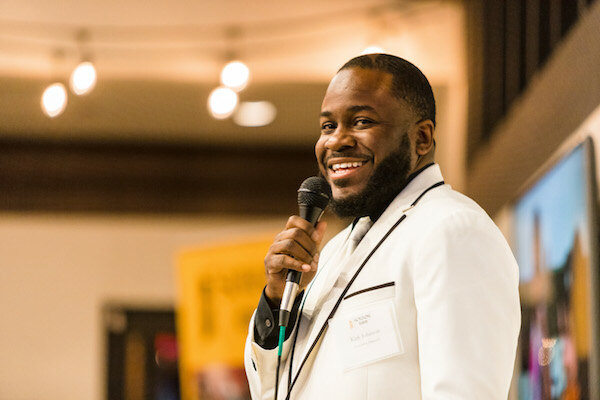 After teaching music in public school and conducting youth orchestras, Kirk founded SOUNDS Academy in 2013. In 2017, SOUNDS Academy has grown. We now have 150 students in our Community and Strings Program. We expose an additional 4,000 students to musical experiences through live performances and our Instrument Petting Zoos. There are now 8 teaching artists that contribute to the mission of SOUNDS Academy. SOUNDS Academy serves four schools and two community centers, with 150 students who create impactful stories that show the power of music. Kirk continues to develop and collaborate with schools, musicians, and organizations while finding the necessary support to serve schools and children on the wait list. As the Founder and Director of SOUNDS Academy, Kirk looks to remove any barriers that prevent children from gaining music education opportunities. Through this vision, Kirk has created an organization where children in lower income neighborhoods can embark upon a musical journey that will mentor them to and through college.